PLEASE NOTE: This show is now sold out! Watch this space for future Lovely Eggs shows in Manchester. Following their Soup Kitchen sell out, we’re pleased to be bringing The Lovely Eggs to the Deaf Institute! The Lovely Eggs are an underground punk rock duo from northern England. They have a fierce punk rock ethos that music should have no rules. For Holly and David being in a band is a way of life. True to this, they live the way they play. Fiercely, constantly in search of the good times. With observational and often surreal lyrics about life The Lovely Eggs have a powerful stripped-down sound: one vintage guitar amp, one Big Muff distortion pedal, a guitar and a drum kit. With releases in the UK, Europe, USA and Japan, The Lovely Eggs have played hundreds of gigs around the UK, USA and Europe supporting the likes of Half Japanese, Shonen Knife, The Slits, The Television Personalities and Art Brut as well as a two-month tour of America and a string of dates at SxSW in Austin, Texas. The Lovely Eggs have recorded sessions for BBC Radio 1, BBC 6 Music and XFM as well as being played by a host of UK DJs including Radio 1’s Huw Stephens and Rob da Bank and 6 Music’s Marc Riley, Steve Lamacq, Tom Robinson, Gideon Coe, Chris Hawkins, Tom Ravenscroft and XFM’s John Kennedy. Holly (guitar/vocs) and David (drums/vocs) have also worked with comedian Graham Fellows (aka John Shuttleworth) as well as Jad Fair from the seminal Texas band Half Japanese. 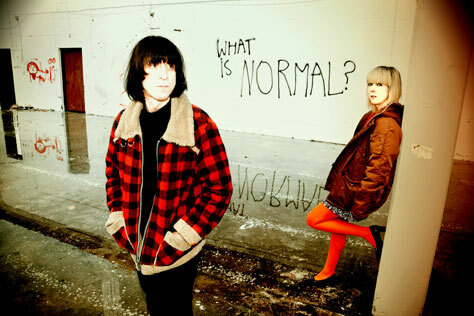 Their songs appear in Canadian film Molly Maxwell and have been sampled by Zane Lowe for Scroobius Pip. The pair also feature on a Radio 4 Richard Brautigan documentary, presented and in discussion with Jarvis Cocker contemplating the influence of the American surreal author on their music. They have produced three albums. The first, If You Were Fruit (Cherryade Records, 2009), ranked in the top 40 records of the year by Artrocker Magazine and was nominated for XFM’s Debut Album of the Year. The second, Cob Dominos (Cherryade Records, 2011), has gained widespread critical acclaim, with Don’t Look At Me (I Don’t Like It) – featuring a video with guest appearance from John Shuttleworth – fast becoming an internet hit. Their third album, Wildlife (Egg Records, 2012), featured the Gruff Rhys-produced single Allergies, originally released on 7″ on the Too Pure Singles Club label. This year sees The Lovely Eggs return with their fourth self-produced and self-recorded album, This is Our Nowhere; a title that sums up their celebration and love of a scene which doesn’t exist in the eyes of the manufactured mainstream. Lead single Magic Onion (made in collaboration with artist and video director Casey Raymond) is to be released on the Cardiff-based D.I.Y. Flower of Phong label. Accompanied by a handmade book of psychedelic/nightmarish proportions, the limited edition 7” includes a B-side of the song with Sweet Baboo, who joins them in an acoustic and decidedly pickled duet. Main support comes from Manchester trio Hot Shorts, who released their debut EP, Web Design, last year. Opening the show is Little Hero – aka Pete Rawlinson.